SFP Landscaping provides high quality landscape design and installation for new homes, new pool installations, commercial sites, home renovations, secret garden areas, patios, and more. Our standard practice is to meet with you, discuss your interests, and prepare a rough design for you to review. Homeowners today want to enjoy their outdoor living spaces. SFP can design and install the perfect space for you: creative patios and walkways, firepits or fireplaces, grill islands, pizza ovens, sitting walls – whatever it takes to help you enjoy your lifestyle. We have creative and knowledgeable designers who will listen to your interests and develop beautiful plans specifically for you. Our experienced professional crews install these features just like they were designed. Give us a call – we can bring your dreams to reality. 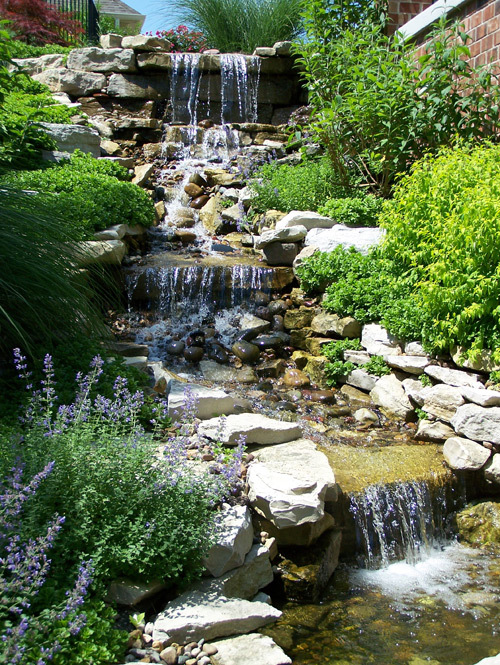 Whether it’s a self-contained fountain, a small pond, a large waterfall, or even a long creek bed with intermittent waterfalls, we can design and install the water feature you dream of. SFP Landscaping has designed and built backyard ponds, live creeks for large estates, dry creek beds, and waterfalls, as well as water features for municipal pools. SFP Landscaping brings great creative skill to water feature design. We’ve been designing and installing professional outdoor landscape lighting for years. Uplighting, downlighting, path lighting – we handle everything required for a casual or formal look. Lighting creates dramatic scenes providing you with a dynamic experience of your property. Your home will take on a magical beauty giving you a warm welcome feeling. SFP Landscape Design Services works with clients to provide the special choice of plant material, and placement of color, height, shape, and texture within a particular space to make an appealing and enjoyable landscape. Our years of experience have provided us with an excellent knowledge of the world of plants from the most common to many of the most unique plants available today. Also ask about SFP’s impeccable commercial landscape designs. Learn more and check out our gallery of completed projects. 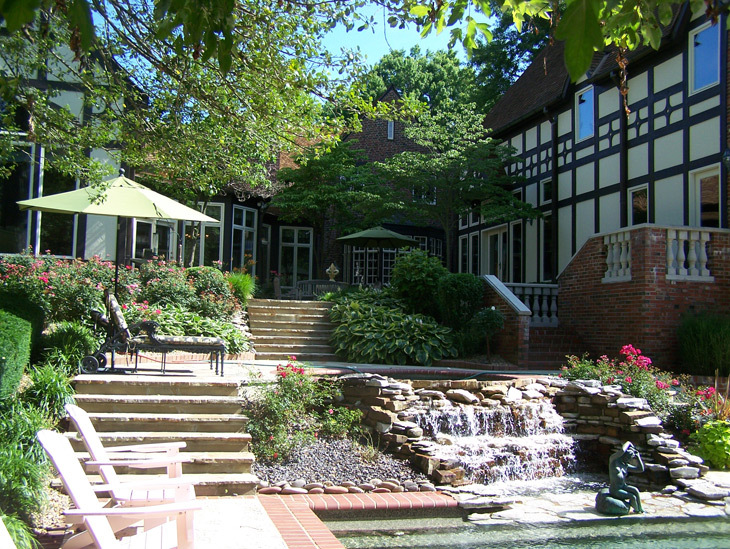 Contact SFP Landscaping for a free and professional consultation, request an estimate online or call 314.544.4436 today. Schedule your free consultation with a SFP Horticultural Expert. To better serve you, please include as much detail as possible. Just wanted to thank you again for all your hard work, efforts and great ideas with my landscaping!! It was so fun to work with you and the crew! I’m already trying to think of more areas that might need some changing!! And thank you so much for the “Drinking Gourd” Hosta and Astilbe. They are all doing great! I will always think of you when I look at them. Thanks again. Great Job!! Your designer and crew did a great job. She is very professional and I enjoyed working with her and staff. Thank you for a job well done. Just a note to thank you again for all you’ve done for me. Your sparkling personality, your sense of design and knowledge has turned what was a disaster into a livable solution. The yard is great and the space between the houses will be fine probably next spring when we install a privacy fence. I am so-o-o-o grateful. I prayed for a miracle and I got one! I hope SFP Landscaping appreciates what an asset they have in you. My mother-in-laws place looks great. Better yet, she is over-the-moon with how the yard looks. Thank you! It has been a pleasure working with you and I am looking forward to the continuation of our project. We love our new landscaping-front and back! It is delightful watching the birds, bees & butterflies enjoying the new blooms! Jen, Eric & their hard working crews were knowledgeable and persistent in tackling some tough issues to complete the job. It’s always a pleasure to have your crews working at our home! Thank you so much. – Mark and Patti B. Tell the fellas thank you for the good job they did with my grass. I’m grateful for the extra time they took in picking up those nasty silk worms from the oak trees. Much appreciated! © SFP Landscaping. All Rights Reserved.